I'm not saying this bill is perfect. I do think it is good - very good even, and will leave many millions of people much better off than before. But sure, there are things in it that I would change if I were starting from a clean sheet of paper. But we all have to understand the choice that we are making here. Our choice is not between this good but not perfect bill or another, better bill that we could pass in a year's time. It's between this or the status quo. Remember that there isn't a single Republican in the Senate, and there is just one in the House, who is willing to vote for even this version of health care reform, let alone the stronger one that we progressives would like. Now remember that there were nearly 40 DEMOCRATS in the house who voted against this current House bill, and there were 3 Democrats (plus Joe) who had a lot of issues voting for it. These people are not going to suddenly change their mind because progressives want something stronger. They don't LIKE PROGRESSIVES. They WANT to defeat progressives. In many cases, the best thing that they can do for their own electoral chances in their states is to be seen to anger us fighting lefties. And because health care reform doesn't exist yet, there's no constituency in their state this is benefiting from it and wants it protected. Social science proves that people are far more loathe to lose something they have than they are eager to get something better. When it comes to the conservatives in both parties who are blocking us here, we have no power over them. Plus, we are likely to be a smaller caucus after the 2010 elections, especially if Democrats fail to achieve their single biggest domestic priority. Failing to achieve health care reform makes us look (and act!) like losers. Losers do not win the good will of voters. But with the modified health care reform passed, a couple of things work in favor of improving and expanding it. A consituency is created for the Health Exchanges. People who are on it will want to protect and keep it. And the number who are on it will go up in time. Insurance industry regulation will kick in right away and will make small but relieving changes to the deals people can get from their insurers. All of this, plus the political bonus that comes from achieving what no other Democratic Congress or President has ever been able to accomplish before should helpt mitigate losses in the 2010 election. The final days of a bill are, almost by definition, the hardest. Critics have had time to mobilize. Industry has had time to lobby. Supporters have endured one painful compromise after another. Enthusiasm ebbs at the exact moment opposition peaks. And as those who would like to see the bill fail organize, those who would like to see the bill succeed nitpick. Joe Lieberman refused to allow Medicare buy-in. Ben Nelson worries over the abortion language. Susan Collins wants to ensure access to catastrophic plans. Progressives are concerned that insurers will game the individual mandate. Name your interest group or constituency and they will name the provision, or set of provisions, that worries them. The goals of covering the uninsured and bending the cost curve remain popular, but the means are, well, more controversial. A bill will pass. Millions will be better off. Those who oppose the bill from the left (a large number) will realise that their cause is better off now than it was before. Those who oppose it from the right will have to find a way to live with it. Either way, by the midterms people will be judging the law, not the bill - and those aspects of it that aren't working can be fixed incrementally rather than as a once and for all take it or leave it deal. Following on from our discussion below, John Podesta does a really good job here of setting out what's IN the Senate Health Care bill for progressives. Refreshing after all the talk about what's not in! 1. Largest Expansion Of Coverage Since Medicare’s Creation: Thirty-one million previously uninsured Americans will have insurance. 2. Low/Middle Income Americans Will Not Go Without Coverage: For low-income Americans struggling near the poverty line, the bill represents the largest single expansion of Medicaid since its inception. Combined with subsidies for middle income families, the bill’s provisions will ensure that working class Americans will no longer go without basic health care coverage. 3. Insurance Companies Will Never Be Able to Drop or Deny You Coverage Because You Are Sick: Insurers can no longer deny coverage because of a pre-existing condition. They can’t rescind coverage or impose lifetime or annual limits on care. Significantly, the bill also ends insurer discrimination against women — who currently pay as much as 48% more for coverage than men — and gives them access preventive services with no cost sharing. 5. Invests in Keeping People Healthy: The bill creates a Prevention and Public Health Fund to expand and sustain funding for public prevention programs that prevent disease and promote wellness. 6. Insurers Can’t Offer Subprime Health Care: Insurers operating in the individual and small group markets will no longer sell subprime policies that deny coverage when illness strikes and you need it most. Everyone will be offered an essential benefits package of comprehensive benefits. 7. Helps Businesses Afford Coverage: Small employers can take advantage of large risk pools by purchasing coverage through the bill’s state-based exchanges. Employers with no more than 25 employees would receive a tax credit to help them provide coverage to their employees. The bill also establishes a temporary reinsurance program for employers providing coverage to retirees over the age of 55 who are not eligible for Medicare. 8. Improves Medicare: The bill eliminates the waste and fraud in the Medicare system, gets rid of the special subsidy to private insurers participating in Medicare Advantage and extends the life of the Medicare trust fund by 9 years. It also closes the doughnut hole that affected 3.4 seniors enrolled in Medicare Part D in 2008. 9. Reduces The Deficit: Not only would the bill expand coverage to 30 million Americans without adding to the nation debt, it would also reduce the deficit by up to $409 billion over 10 years. 10. Reduces National Health Spending: A CAP-Commonwealth Fund analysis concludes the bill could reduce overall spending by close to $683 billion over 10 years – with the potential to save families $2,500. Even the most conservative government estimates conclude that the bill would reduce national health care expenditures by at least 0.3% by 2019. If enacted, this would be the most profound structural reform in my lifetime. If not enacted, I fear we may not see this problem solved in my lifetime. Should Progressives Oppose the Senate's Health Reform Bill? Today I received an e-mail from Taylor Kunkle, former Chair of Democrats Abroad's Cambridge chapter and all around good guy. Taylor and I have been corresponding since early in the primary cycle, and he was a fervent and effective Obama supporter working on Barack's behalf from way back when. I have come to a conclusion about the current health reform effort and I thought I would share it with you. The insurance companies would receive a windfall in taxpayer subsidies, further increasing their profits and sinking the country further into debt. The only part of the legislation that made these two “reforms” at all palatable, was the addition of a government-run alternative to the private insurance market. With this feature now stripped from the bill, I cannot in good conscience support the bill. I have already written to the White House stating this (not that it will matter, but it made me feel better), and I am now actively working with and contributing to groups who will be fighting to kill this bill. It is with a heavy heat that I have come to this decision, because I know it puts me at odds with a president I worked so hard to get elected. It is with an even heavier heart that I have to admit how disappointed I am in President Obama over this issue. I really feel that he did not lead the country well on this issue and I am now very pessimistic about the future, especially the 2010 elections. I fear that if the President and the Congressional Democrats have managed to kill my spirit, then I hate to think of how many lukewarm supporters they have turned off. I just read in the Daily Kos that a recent poll showed that over 80% of Republican plan to vote in the next election. That number is 55% for Democrats and only 39% for Democrats aged 18-29. Democrats are losing their base and this spells trouble for 2010. I still hope that we can get good health care legislation passed, but I believe that we first need to make sure the legislation now before the Senate does not pass. Democrats should then look at bringing back the idea of Medicare for all and push such a bill through Congress under the budget reconciliation process (requiring only 50 votes with no filibuster). I am sure you have your own opinions on this issue and you may not agree with me at all. That is fine. I encourage you to follow your convictions and stay involved in the process. We can only bring about change if we stay involved. As readers of this blog will know, I have remained a staunch advocate for this bill through all its various permutations, and I remain so now. But I am having a lot of conversations with people similar in spirit to Taylor's message, so I think it is time that I explain my reasoning in some more detail. As background, I should explain that when I decided to support then-Senator Barack Obama in the Democratic primary, health care reform was a very important part of the reason why I chose him over his main rival, then Senator Clinton. This is despite the fact that on the core policy area where the two of them seemed to differ - Obama's opposition to an individual mandate for helath insurance and Hillary's strong support of one - I actually preferred Senator Clinton's position on the merits. Why? Because I read his statements on health care reform and what he seemed to be displaying throughout was an understanding that we must do whatever it takes to bend the curve of higher costs and decreased accessibility. I have a very vivid recollection of Bill and Hillary's health care fight in the early 90's, and I have always believed that the Clintons' total failure to brook compromise or negotiation in support of what they considered to be the optimal bill had horrific costs - depriving Democrats of their Congressional majority in the next election and, far more importantly, allowing many millions more Americans to become uninsured and many thousands to die for lack of coverage. What I was looking for was a President who would push very hard for the best possible deal, but would make sure AT ALL COSTS that a deal got done. So far, Obama has lived up to my own hopes in this regard spectacularly. We have to remember that the reason there has never been a comprehensive health care reform passed every before in the history of this country is not because Democrats are weak and ineffectual, but because there are very powerful forces in place to stop this from happening - forces of money, power, incumbency and influence certainly, but also the less sinister ones of inertia, fear of the unknown, ignorance, and people's contentness with their own care providers. When Roosevelt passed the Social Security act, the original bill offensively excluded women and minorities. In fact, the NAACP of the time protested against the bill, describing it as, “a sieve with holes just big enough for the majority of Negroes to fall through.” Roosevelt felt he had no choice but to do this, to secure the votes of racists and reactionaries in his own party. But once the bill had established the principle of fundamental protection for the elderly, expansion of the act to these excluded groups became possible, and in time those offensive provisions were removed. I don't think today that you could reasonably argue that the Social Security Act is harmful to minorities. A similar story could be told about the introduction of Medicare by Johnson in 1965. My point is that both of these programs, however imperfect they were at inception, however compromised they were from a progressive point of view, were a massive step forward for Americans, and have eben built upon and improved considerably since. At the same time, once Americans started to see the benefits of these changes, the programs became politically untouchable - no one can seriously propose to dimantle them now. A similar thing happens here in the UK, where no political party can raise the possibility of replacing the NHS for fear of political death. Once people have a benefit, they are extremely loathe to lose it. That's why it's important to get the policy right, but it's even more important to get the policy OUT THERE. So although I have always been willing to kick and scream and use every tool of persuasion available to me to get a better bill, the one outcome I was never willign to accept was not passing anything at all. Our system is so catastrophically broken across so many different levels (we pay twice as much, have lower life expectancy, and are spectacularly wasteful), that the most dangerous thing we could do is nothing at all. Leaving things as they are would decimate the federal budget, rapidly escalate the number of uninsured, and allow costs to rise to the point where decent care is difficult even for the affluent to afford. Almost anything would be an improvement. Does this Bill Make Things Worse? But, this only holds true so long as what you are passing is an improvement, however marginal. Taylor claims the opposite: that this bill would make the health care system in the US worse rather than better. This is an important argument, because if true that woulld be the best and only reason why progressives (and, frankly, everyone) should oppose it. But I do not find either of the rationales that Taylor supplies here at all convincing. 1) That leaving in an individual mandate without stronger cost controls than are currently in the bill would leave consumers worse off. A ban on denying insurance for pre-existing conditions. Risk mitigation - there are a lot of boring financial reforms that prevent insurers from using the kind of risky reinsurance models that have caused so much damage to the financial markets. There's a lot more as well. But no, consumers would not be purchasing the "same crappy products" that are being sold now. They would be purchasing slightly less crappy products. 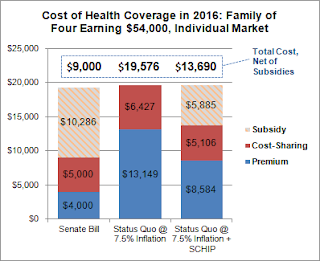 To be specific when it comes to the amount of cover contained within a single insurance plan for an average family, "According to the CBO, the amount of coverage in the individual market would improve by between 27 and 30 percent under the Senate's bill." But that's neither here nor there, as Tayler correctly points out, if we are then forcing people to buy insurance that is too expensive for them. Now, of course the obvious thing that jumps out at you is how much of the cost savings to families comes from direct government subsidies. So the obvious question is: does this level of subsidy threaten to increase the Federal budget deficit. Well, every single analysis from the Congressional Budget Office (whose job it is to assess the federal budget implications of proposed legislation) has said the opposite - that on balance, the bills would REDUCE the federal deficit by a significant amount despite the increase in expenditure in some areas? Why so? It's complicated, but basically because the current way that we pay for public sector health care is so (to co-opt Nate Silver's phrase) "batshit crazy". But still, Taylor asks, why include the individual mandate at all? Wouldn't it be better to try and reduce costs and then encoruage people to buy in to the program, but not require it? If eliminating the individual mandate were the cost of getting reform passed, I would reluctantly agree to it - but I would do so knowing that we were doing far more significant to the principle of cost containment than we did when we reluctantly allowed the limited version of the public option to be scrapped. Why so? Because by requiring everyone to participate in the health insurance market, we add relatively healthier people into the system, which on the whole reduces the costs across the board. Under the current model, relatively healthy and realtively poor people can chose to not buy insurance and gamble that they won't get sick. If they do get sick, they can take emergency room visits or go into debt for critical care - and eventually declaring bankrupcy would not be unusual. But if these individuals were driven to the market, complete with subsidies to make it more affordable, the cost savings could be shared out across all insured AND the negative economic repercussions from the small number of catastrophically ill or injured form this group would be mitigated. This principle of universality is important in understanding how to construct an effective market. We could do reform without it - just like Roosevelt had to do Social Security without covering women or minorities - but it would make the bill less universal and less cost containing. Not the improvement progressives (like me!) say they are looking for. 2) That the bill would be a profits bonanza for insurers and thus "sink the country further into debt". It would not increase the national debt. It would decrease the national debt. By about $130 billion. "CBO and JCT estimate that, on balance, the direct spending and revenue effects of enacting the Patient Protection and Affordable Care Act would yield a net reduction in federal deficits of $130 billion over the 2010-2019 period." Would it increase insurance company profits? Well that's a really good question! One of the things that was rumored to be in the compromise negotiated by the Democratic Caucus in exchange for dropping the public option was a provision to require that insurers must spend a minimum of 90% of their income on health care delivery. This would constrain profits without putting (effective) insurers out of business. I really liked the provision and hope it is still in there - haven't heard anything about it despite all the hullabaloo about the reversal on Medicare Buy-in. But let's be clear - to the extent that insurance company profits are increased by bringing in lots of new customers, this is a feature, not a bug! After all, we are TRYING to increase the number of people who have health insurance! Is it bad that they would make a profit? Well, arguably yes. Another idea from the proposed compromise that I really liked was to put in place OMB administered not for profit insurers - again, I don't know if that is still in there but I really hope it is because it was a good idea, replicating the success of the existing program for federal workers. So I do agree that insurance company profits need to be constrained. A lot of the existing reforms are already aimed at doing that. But in the absence of a government run single payer system, if we want to expand access to health care, for profit insurers are going to play some role in doing that. And we DO want to expand health coverage! So they will make some profits. Maybe even more than before. But so long as this is happening because they are genuinely providing health cover to a lot more people, why shouldn't they? I believe that we first need to make sure the legislation now before the Senate does not pass. Democrats should then look at bringing back the idea of Medicare for all and push such a bill through Congress under the budget reconciliation process (requiring only 50 votes with no filibuster). But he doesn't seem to see how the first one makes the second one impossible! This is the biggest majority Democrats have had in our lifetime, or will have. And we still don't have the votes for a more progressive plan than this. We will almost certainly lose seats in Congress in the next election. Historically, the party in power almost always does. UNLESS, that party is see as spectacularly effective. Failing to deliver our single biggest domestic policy priority does not equate to "spectacularly effective". Taylor mentions the reconciliation option. I think this approach would be worth trying should all else fail - I'll try ANYTHING, honestly! - but reconciliation is a far more limited tool. First of all, any legislation passed is time limited. Secondly, there are strong limits to what you can and can't pass under this process, meaning the bill would have to be broken up and passed in increments. Since Taylor's concerns seem to stem mainly from the absence of a public option within the insurance exchange, I'd like to propose the opposite approach. Let's pass this bill through the full Senate process. THEN, let's pass a separate, smaller, easier bill that simply creates a public option within the exchnage. That would be completely achievable and would result in a better, more long lasting, harder to reverse health care reform than going for reconciliation on the full bill. Plus, it would enable Democrats - rightly! - to tell Americans that they have begun to deliver on thier longstanding promise. And that Republicans fought them every step of the way. Taylor, if you want to respond I'll gladly post your further thoughts. This is an important conversation, and I'm really glad we are having it. Standing up for who's principle, exactly? "Joe Lieberman -- standing up for his principles on health care is being viciously attacked by the liberal left...what a disgrace!" Well color me puzzled! Which of "his principles" is Joe supposedly standing up for here? The principle that he stood for just 3 months ago was that allowing older people to buy in to Medicare would be a really good idea! Now, Joe's principles say the allowing older people to buy into Medicare is such a dangerous idea that he'd rather scupper the whole legislation, allowing millions to remain uninsured, before he'd even vote to allow for a vote on it. If Joe Lieberman were standing up for his principles, I'd say fair play to him! In Which I Throw up my Hands and Shout "These People are Crazy!" So as you will know, I have recently been writing and thinking about how it may be OK for progressives to give up some things they really care about in the service of pushing forward a health care reform that will make the whole system better. I was willing to swallow a hideously anti-woman provision on abortion. I was willing to argue against my fellow progressives in pointing out that there may be other ways to achieve cost savings apart from the (preffered) approach of pursuing the public option. I have been urging progressives to recognise that so many people will die (about 150,000, by a conservative estimate, apparently) without healthcare reform, and so many more will be financially ruined, that it was worth an awful lot of pain and sacrifice to get it through. I have been arguing that the passage of this bill will make so many people's lives so much better - even considering that (in the case of the Stupak amendment) a lot of lives would actually be made worse - that the only responsible thing to do is to push hard for the best deal we can and then pass whatever that winds up looking like. But it turns out, that I have been the problem, all along. Because Joe Lieberman reads the willingness of myself and fellow progressives to make this bill happen as a sign that clearly it can't be a good one. So clearly, I ought to have kicked and screamed and called the medicare buy in proposal a "shameless corporate sell out" (even though it's... ya know... NOT) because that would have signalled to Lieberman that this compromise represents reasonable centrism. Note, by the way, that this signal is apparently not sent by actual FACTS or analysis - he has chosen not to wait for the CBO report which he last week cited as being essential to making up his mind - on the grounds that, as Ezra Says, "the CBO is expected to say it will [neither increase the deficit nor harm Medicare solvency]. Someone must have given Lieberman a heads-up on that, as he's decided to make his move in advance of the CBO score, the better to ensure the facts of the policy couldn't impede his opposition to it." Just for the sake of discussion, what if Weiner, Dean, and Sanders had all expressed disappointment with the Medicare buy-in compromise? Would Lieberman -- who not only ran on a Medicare buy-in platform in 2000, but also signaled some preliminary support for the idea last week -- be willing to kill reform over the idea now? Obviously, this presumes that Joe Lieberman is a small, bitter man, who puts foolish vendettas over the interests of his constituents and his country. Given the circumstances, that doesn't strike me as an outrageous stretch. I'm not crazy about the "Joe Lieberman is a jerk" theory of political failure - I want to believe that there's some rational explanation for why he might suddenly oppose health care reform that he has supported all his life and would seem to take great delight in waiting until Democrats seemingly have a deal then pulling the rug out from under them. But I can't really think of one. Note: I'm not saying that I can't think of a rational explanation for opposing health care reform - there are some rational, if not IMHO very good reasons to do so. Ben Nelson strongly opposes abortion. Olympia Snowe is subject to pressure from the Republican caucus. Blanche Lincolne and Mary Landrieu have their own elections to worry about. These are all rational concerns - although I don't think they're good reasons for letting our health care system crash around our ears. But Joe is just... being a jerk. Tell me how to look at it any other way?